© Baquero et al. ; Licensee Bentham Open. We describe a case of delusional psychosis that was terminated by neurosurgical removal of a large arachnoid cyst. The patient was suffering his first psychotic episode and had symptoms typical of schizophrenia. The case underscores the importance of considering that an arachnoid cyst can induce psychopathological symptoms, even those of schizophrenia. Indeed, such symptoms may be the cyst's only clinical manifestation. In addition, the case highlights the importance of doing a structural imaging test when confronted with a first episode of psychosis, especially if the episode is relatively late in appearance. Such imaging may lead to a diagnosis that in turn can enable a definitive neurosurgical resolution of the psychosis. Keywords: : Arachnoid cysts, neurosurgery, psychosis, psychiatry. The patient was a 37-year-old Caucasian man who was the second of three siblings. He was married, the father of two sons, and worked in his family's business. He came, as an outpatient, to our department because he was suffering psychopathological symptoms of psychotic characteristics. The patient's family members reported that two months before the first consultation he started coming out with strange ideas: he thought that people he passed in the street somehow knew him and were following him in order to harm him or his family. He also expressed unusual beliefs, such as, that his digital television tuner stopped working in his presence and that radio commentaries of court cases were really subliminal messages directed at him. In association with these perceptions, he suffered an anxiety crisis with a sense of his imminent death and somatic symptoms (trembling, palpitations and feelings of suffocation); he was treated with Alprazolam 1.5mg/day. His state of mind worsened, and in the three weeks prior to the first consultation he suffered apathy, anhedonia and desperation. Two weeks before the first consultation, his family doctor prescribed him Alprazolam 0.5 mg/day, Alprazolam retard 1 mg/day, and Escitalopram 15 mg/day, but no improvement was reported. Although the above symptoms clearly began two months before the first consultation, the patient's wife reported that for the previous year the patient had been especially worried about some judicial proceedings in which he was implicated. With regard to personal antecedents, the patient was diagnosed with serious depression with intention to self-harm when 14 years old. This depression remitted without medication within six months. Coinciding with the depression, there was an episode of involuntary movements of the left arm. The patient did not report any addictions or substance abuse. The patient had no history of head trauma or other medical or metabolic conditions. In the first consultation, the patient was partially disoriented in time but oriented in space and person. He was confused, of labile attention, and with slowed speech. He gave answers unrelated to questions, was slow to answer even simple questions and suffered blocking in his thinking. He presented delusional interpretations and intuitions and a delusional paranoid reference of events to himself. He showed sadness, emotional lability, apathy, anhedonia, but did not express thoughts of death or self-harm. He reported anxiety and had somatic manifestations of this (paraesthesias, palpitations, trembling in the hands, and diaphoresis) and a sense of restlessness. We did not detect any alterations in sensory perception or in the experience of self-identity. The patient reported fragmented sleep with nightmares. His appetite was normal. Weight: 70 kg. Height: 180cm. Blood pressure: 100/60mmHg. Body mass index: 21.6kg/m2. Pulse rate: 70 bpm. Temperature: 36.7°C. Arterial oxygen saturation: 98%. Lungs were well ventilated without noise. Heart beat was rhythmical, without murmur. Adbomen was soft and depressible, the lower part being slightly painful to palpation. There were no masses, enlarged organs, or evidence of peritoneal irritation. There was no costovertebral angle tenderness. There was no motor or sensory deficit. There was no signs of a neurological focus. Osteotendinous reflexes were normal. Gait was normal. After psychiatric evaluation the patient was hospitalized. Brain Magnetic Resonance Imaging was undertaken and revealed a large arachnoid cyst in the right hemisphere (Fig. 1). Study of the parietal calvarial region and brain stem showed relative thinning adjacent to the cyst, a finding suggestive of a congenital anomaly (Fig. 1). Cerebral magnetic resonance image showing an arachnoid cyst in and displacing the right hemisphere. Our neurosurgery department proposed surgical treatment of the cyst. Surgical fenestration (the making of small perforations) of the cyst was done by minimally invasive endoscopic surgery through right temporal trephine. This fenestration created a communication between the arachnoid cyst and cisterns located in the base of the skull allowing a wide circulation of cerebrospinal fluid. The tissular observation through intra-operative imaging confirmed the presence of normal arachnoid tissue and ruled out features of malignancy. There were no complications during surgery. To reduce possible cerebral edema after surgery, dexamethasone 4mg/day was prescribed for a week. Phenytoin 300mg/day was prescribed as a prophylactic against convulsive crises for a week also. The patient complained of headache during the first week after the surgery, which was controlled with a standard analgesic protocol (paracetamol and metamizole). 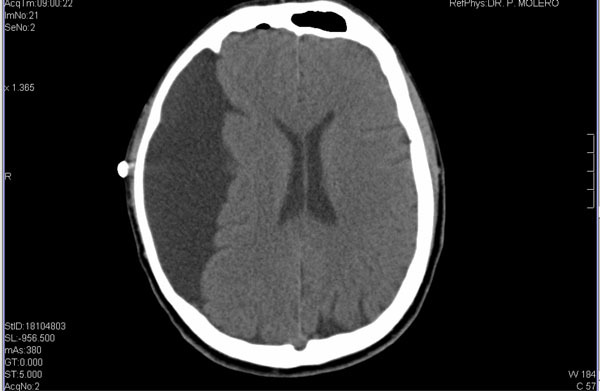 One week after the surgery a brain computed axial tomography revealed a small left subdural hematoma without mass effect (Fig. 3). The surgical wound healed without complications. Six months later another brain computed axial tomography showed no signs of the mentioned hematome. A magnetic resonance imaging 10 mounths after surgery ruled out recurrence of the cyst. There was a transitory worsening of the affective symptoms during the first week after surgery. Brain Computed Axial Tomography one week after the surgical treatment of the arachnoid cyst. For four weeks prior to surgery the patient had received psychopharmacological treatment (escitalopram at a dose of up to 20mg/day, quetiapine at a dose of up to 300mg/day, clonazepam at a dose of up to 3mg/day, mirtazapine 15mg/day and lormetazepam 2mg/day). Despite this treatment, psychopathological symptoms (confusion, paranoid reference of events to self, delusional intepretations and fears that others intended harm, rumination on negative thoughts, sadness, emotional lability, apathy, anhedonia and social withdrawal) persisted. 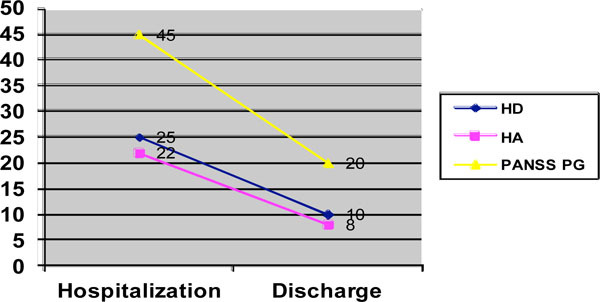 Improvement in this respect only occurred after surgery, when there was a 64% reduction in the Hamilton Anxiety Rating Scale Score , a 60% reduction in the Hamilton Depression Rating Scale Score  and a 55% reduction in PANSS General Psychopathology Scale Score  (Fig. 2). Hamilton scale scores for depression and anxiety and the PANSS general psychopathology scale score. The duration of hospitalization was six weeks. In follow-up consultations, the patient showed global improvement with complete remission of delusional symptoms. He resumed his professional life and returned to normality in his family and social roles. Family members confirmed the improvement. The provisional diagnosis was: Psychotic disorder with delusions due to known physiological condition (in this case, an arachnoid cyst) (ICD-10: F06.2 / DSM-IV:293.2). The diagnosis was confirmed by the patient's progression. In Psychotic disorder with delusions due to known physiological condition, persistent or recurrent delusional ideas predominate and these can be accompanied by hallucinations. However, this category of disorder is not limited to the above characteristics: there can be features suggestive of schizophrenia, such as bizarre hallucinations or thought disorders [4, 5]. The arachnoid cyst is a benign congenital collection of cerebrospinal fluid that account for about 1% of all space-occupying non-traumatic intracraneal lesions . The principal location is the temporal fossa. The clinical signs and symptoms of the cyst, if any (it is often an incidental finding), depend on the cyst's location and size and on the patient's age. The most usual psychiatric symptoms are psychosis, alexithymia, attention deficit and hyperactivity disorder (especially if the cyst is located in middle cranial fossa of the left hemisphere), delusions involving paranoid reference of events to self, obsessive religiosity, sense of guilt or ruin, hallucinations, depression, insomnia, irritability and cognitive alterations. Usually, the above symptoms are reversible and there is significant improvement after surgical decompression [6, 7]. In the case described, the sudden onset of psychotic symptoms in a patient without personal or family antecedents of psychosis, enables us to evaluate the possibility of a causal relationship between the arachnoid cyst discovered by magnetic resonance imaging and the set of symptoms. Despite the rarity of arachnoid cysts, there are other reports of patients with associated psychotic symptoms that could be explained by pressure generated by the cyst on the temporal lobe and other nearby structures [8, 9]. An interesting aspect of the case reported here is the contrast between the patient's almost non-existent response to pharmacological treatment and the striking global clinical improvement, without relapse, obtained through neurosurgery. This contrast is congruent with similar findings of an arachnoid cyst in two patients with psychosis in which a surgical intervention was not performed and complete remission of the psychotic symptoms was not achieved in spite of antipsychotic therapy [10, 11]. Arachnoid cysts have also been associated with cognitive dysfunction  and organic personality disorders . In both associations, the psychiatric complications have been found to be transitory: to abate after neurosurgery. These cases and that described here are a reminder of how important it is to conduct a brain imaging study in patients suffering their first psychiatric episode, irrespective of whether the episode is psychotic, affective/mood or cognitive in nature. Also, this case rises the issue of the consideration of surgical indication of arachnoid cysts on the basis of thepresence of psychiatric symptoms as the only clinical presentation. Hamilton M. A rating scale for depression J Neurol Neurosurg Psychiatr 1960; 23: 56-62. Kay SR, Fiszbein A, Opler LA. The positive and negative syndrome scale (PANSS) for schizophrenia Schizophr Bull 1987; 13(2): 261-76. The ICD-10 Classification of Mental and Behavioural Disorders: Diagnostic criteria for research World Health Organization 1993. American Psychiatric Association. Diagnostic and statistical manual of mental disorders. 5th ed. Washington, DC 2013. 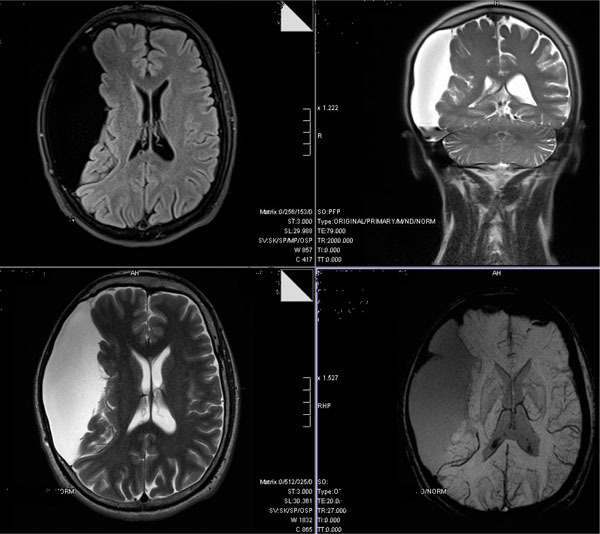 Wester K. Intracranial arachnoid cysts-do they impair mental functions? J Neurol 2008; 255(8): 1113-20. Gelabert-Gonzalez M. Intracranial arachnoid cysts Rev Neurol 2004; 39(12): 1161-6. Bahk WM, Pae CU, Chae JH, Jun TY, Kim KS. A case of brief psychosis associated with an arachnoid cyst Psychiatr Clin Neurosci 2002; 56(2): 203-5. Vakis AF, Koutentakis DI, Karabetsos DA, Kalostos GN. Psychosis-like syndrome associated with intermittent intracranial hypertension caused by a large arachnoid cyst of the left temporal lobe Br J Neurosurg 2006; 20(3): 156-9.
 da Silva JA, Alves A, Talina M, Carreiro S, Guimarães J, Xavier M. Arachnoid cyst in a patient with psychosis: Case report Ann Gen Psychiatr 2007; 6: 16. Kuloglu M, Caykoylu A, Yilmaz E, Ekinci O. A left temporal lobe arachnoid cyst in a patient with schizophrenia-like psychosis: a case report Prog Neuropsychopharmacol Biol Psychiatr 2008; 32(5): 1353-4. Bechter K, Wittek R, Seitz K, Antoniadis G. Personality disorders improved after arachnoid cyst neurosurgery, then rediagnosed as 'minor' organic personality disorders Psychiatr Res 2010; 184(3): 196-200.